I got an Ice Tube clock from Adafruit because, well, I like clocks and electronics kits. The Ice Tube clock is definitely an interesting kit, made so by the use of the blue-glowing high voltage vacuum florescent display (VFD) tube. 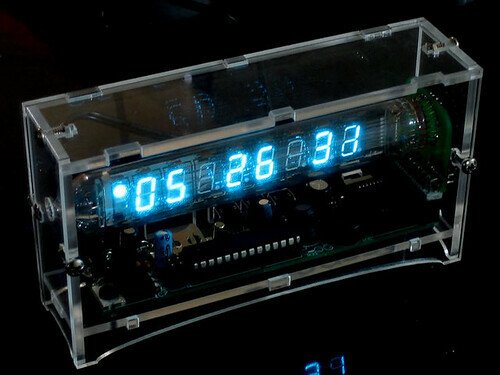 The clock consists of an ATmega168 which runs a counter accurate to ~+/- 1 second per 24 hours. The circuit contains an input from a wallwart type power supply but also includes a back-up battery. The display is only lit when plugged in but the battery provides enough power to keep time for months. In order to operate the VFD tube a much higher voltage is needed. To generate the higher voltage a boost converter is constructed with one of the outputs of the ATmega, an inductor and a few capacitors. The pin from the ATmega controls the duty cycle of the converter, which is used to control the overall brightness of the display. The actual control of what the pins on the display are doing is left to the MAX6921 VFD driver chip. The ATmega sends the data over SPI to the MAX which coordinates the high voltage pins of the tube to generate the clock display. While constructing and testing the circuit it’s important to remember that the part of the circuit nearest the drive chip operates at a high voltage and that it can take minutes for the capacitor to dissipate. Just be mindful of it while testing things before you put the case on. The instructions available on Ladyada.net are pretty straightforward. The kit comes with sockets for both the Atmega and the VFD driver chip. They don’t increase the profile any more than the other through-hole components. Being able to solder in a socket removes having to worry about burning out a chips pin by soldering too long. The most tricky part is making sure the tube is aligned and getting all of the leads started. After that it just takes some patience to wiggle the board down evenly. The clear acrylic case, designed by Amanda Wozniak is a perfect fit for the style of the rest of the clock. The clever way that the bolts and nuts are used to make the joints is really interesting. I look like it could almost slip right into pieces but each bolt puts just enough tension on the rest that it stays snugly in place. I would recommend this kit to anyone fond of clocks or unconventional electronics bits. Just follow the instructions and the high voltage isn’t anything to be worried about.